Why did versus populum (the priest facing the congregation) become commonplace after Vatican II, when ad orientem ("facing east," with the priest's back to the congregation) was the norm before Vatican II? Did a Vatican II document prescribe versus populum? No Vatican II document said that priests must face "toward the people" (versus populum). 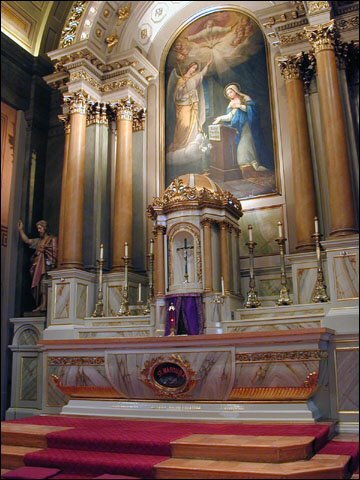 In fact, all Masses today can be celebrated ad orientem ("toward the east," the same direction the people face, which is toward the tabernacle). During the aftermath of Vatican II, Otto Nussbaum's study, which concluded that versus populum was the norm in the first four centuries of Christianity (although this is disputed), influenced many modernists today who want to return Christianity to its "primitive roots." Versus populum is also in accord with Vatican II's relative anthropocentrism. ‘Quod’ (‘which is’) naturally refers to the first clause of the sentence, not the second, which is subordinate to it. See C.M. Cullen and J.W. Koterski ‘The New IGMR and Mass versus populum’ Homiletic and Pastoral Review June 2001 pp51-54. Not the answer you're looking for? Browse other questions tagged catholicism mass or ask your own question. When/why did the [N]RSV become a “Catholic” Bible instead of a “Protestant” Bible? In Catholic Church History, when, why and by whom did the four living creatures become associated with the four evangelists? Why did the medieval church become involved with marriage? If you request and receive pastoral advice from a priest, are you culpable if the advice is wrong? Can a male Catholic and a female Non Catholic have their marriage blessed at the Sacristy?